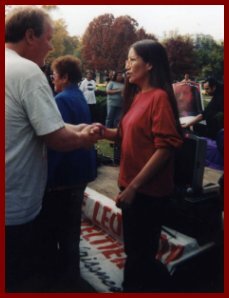 "I'm a supporter of Leonard Peltier's struggle. 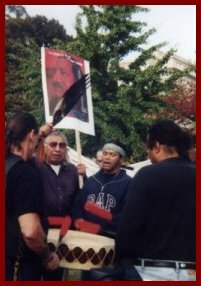 It is a struggle that is deeply rooted in the struggle of Native American people, the history of Native American people. It is a struggle that is rooted in the struggle of those people who've been oppressed. Leonard has made his sacrifice. We cannot forget Leonard. We demand that Leonard be paroled. 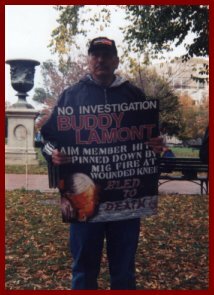 There's no evidence-- there's no reason why he should be still incarcerated and we will continue to struggle for his freedom as long as we have breath." 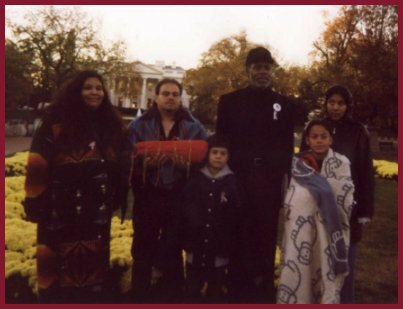 November 25, 1999, Washington, D.C.
in Washington, D.C.; just before closing ceremony on Nov. 25, 1999. 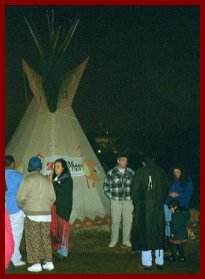 Ceremonial Tipi at the Ellipse in front of the White House prior to closing ceremony. 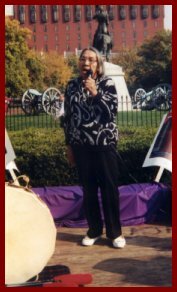 Closing Procession from Lafayette Park to the Ellipse in front of the White House. 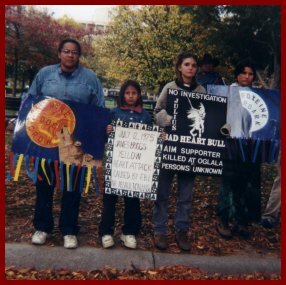 The Thanksgiving holiday is based on a lie -- an official myth about mutual support between Native peoples and the English settlers. 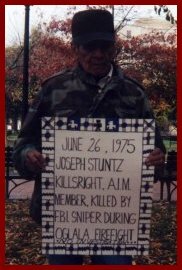 In reality, the genocide against the Indians of North America was started with fire and sword by the Mayflower Pilgrims, and raged across the continent until most Native people had been killed and the survivors forced into grim concentration camp reservations on the worst land. 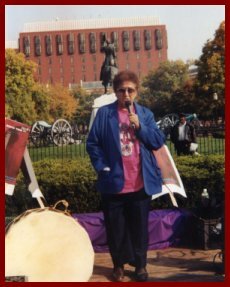 This Thanksgiving Day, the truth about the treatment of Native peoples and their demand for justice was drummed into the heart of Washington DC -- during the final event of Leonard Peltier Freedom Month. 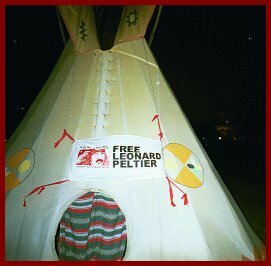 Native American political prisoner Leonard Peltier has now spent 23 hard years in federal prison, for defending the Native people of Pine Ridge reservation during the brutal government persecutions after the occupation of Wounded Knee. 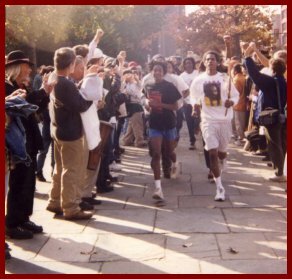 Thousands of people have participated in actions demanding his freedom during this month.